Seven of Wands (R) says when you achieve a position of leadership, there will always be others who crop up to challenge you. You will have to face the jealousy of those who want what you have. You will encounter situations when it will “appear” that everyone is against you – be realistic about the odds you face. “Feel” the strength within you, don’t allow fear to discourage you – recognize that your position is always stronger than you think it is. Never be indecisive or allow yourself to sink into anxiety or depression. Come to a clear course of action and your self – confidence will return to overcome the anxieties and outer problems. Always have complete trust in your “inner” voice. Remain patient, make no unwise decisions – do not feel threatened, for you are never alone. Paranoia. Unnecessary precaution or hesitation. Lack of sufficient conviction on professed beliefs. Cowardice. What beliefs or opinions are you holding on to, despite criticism and social pressure? What result would you ideally like to see, if it could be anything you wanted? How can you most effectively take a stand and present your point of view? 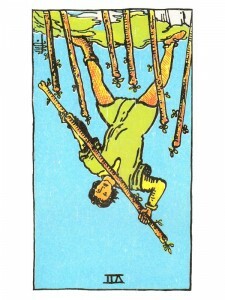 Next to Hanged Man: Give in, being stubborn will not solve anything and can damage your character. Next to Death: Slow down, it isn’t worth it – you are going about things the wrong way. Next to Temperance: Re-evaluate your situation now – you need more time to reach your goal. In the first position: This lifetime represents a major jump in responsibility for the knowledge you are about to receive on this leg of your journey, but you are ready. In the second position: Shore up any cracks in your purpose and resolve before committing to any new campaigns. You may have manpower and material, but your validity and/or your resolve is questionable. In the third position: While decisions and action will come easily, so does reaction. But now that you know what your ground is, you can stand and defend it. You may be bombarded with unsolicited advice. In the fourth position: While this archetype recognizes that the love here includes, by necessity of this path a taste for blood to pique one’s courage, a pitfall here would be in losing sight of the faith, the cause behind the fight. At an extreme, this reader would love the fight purely for itself. In the fifth position: Rather than taking up a position for something, you may be setting yourself up against something. Work toward the positive, not against the negative. You will draw more than enough adversaries to keep you busy. In the sixth position: Look for what you love, not for what you detest. In the seventh position: At one extreme, a refusal to see the value in another man’s proposition and to yield to it is a refusal of God’s command as surely as Satan’s misunderstanding and subsequent disobedience. In the eighth position: At one extreme, there may be a serious contest, a battle to defend your position, your beliefs. At the other extreme, you may not be standing up for them at all. Here the Physical/material Plane is not seen with enough reverence. In the ninth position: Now that you are discovering your spiritual muscle, you have the urge to exercise it. This suggests that you may not be concerned enough with where and why you display your new strength. In the tenth position: Do not become so preoccupied with defending your present position that you stop growing.